The spinal cord stimulator will not cure your pain. But, you should see a reduction in your pain of 50 percent or more if the stimulator procedure is successful. The goal of the spinal cord stimulator is to allow you to be more active and take less pain medication with less pain. The spine is made up of 24 bones called vertebrae that stack on top of one another. Each vertebrae has a ring of bone that encases and protects the spinal cord. 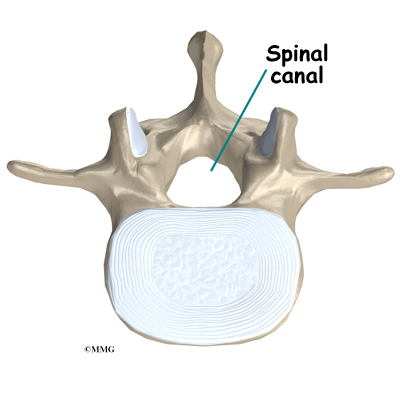 When the vertebra are stacked one on top of the other, these rings of bone create a hollow tube called the spinal canal. The spinal cord is a tube of nerve cells that create the motor and sensory pathways that link the brain to the body. 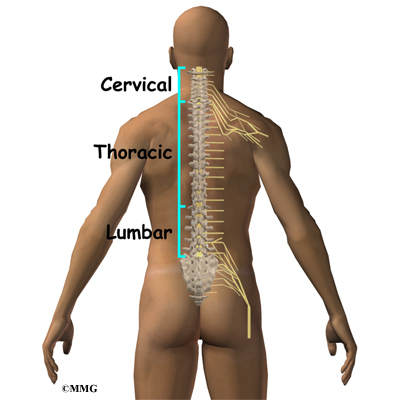 The spinal cord runs through the spinal canal from the brain to the lower spine. Inside the spinal canal, the spinal cord is covered by a watertight sac called the dura. Inside the dura, the spinal cord is bathed by cerebral spinal fluid that cushions and protects the fragile nerve tissue. In between the vertebrae are intervertebral discs. The intervertebral discs cushion the spine and make it flexible. The nerve roots exit the spinal canal between the vertebrae. The openings in the spinal canal where the nerve roots exit are called neuroforamen. If there is not enough room for the nerve roots to easily travel through these neuroforamen, this can lead to irritation and pressure on the nerves. This may cause symptoms of nerve dysfunction such as burning, pins and needles, and hypersensitivity. Pain from an irritated or pinched nerve root follows a pattern that matches where the nerve travels through the body. In the case of the lower or lumbar spine, these nerves travel into the lower extremities. Damage to nerves can lead to a specific type of pain called neuropathic pain. Neuropathic pain can have many sources, for example: amputation leading to phantom limb pain, diabetes causing peripheral neuropathy, shingles leading to post herpetic neuropathy and injuries leading chronic regional pain syndrome (CRPS). When the spinal nerve roots have been damaged due to constant pressure or irritation, this is also considered neuropathic pain. Neuropathic pain is difficult to treat. Medications have not been very effective in relieving this type of pain. Spinal cord stimulation is one technique that pain physicians find helps to reduce the symptoms of neuropathic pain. Spinal cord stimulation can be thought of as blocking the pain signal as it travels up the spinal cord to the brain. The small stimulator device is similar to a pacemaker and is implanted underneath the skin, usually in the lower abdomen or upper buttock. The device is connected to special electrodes that are positioned over the back of your spinal cord by wires placed inside the spinal canal. 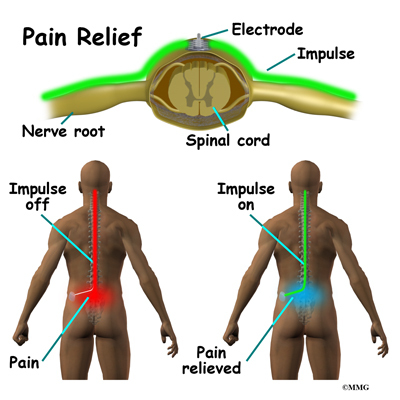 The stimulator device delivers an electrical current to the electrodes that interrupts the conduction of the pain signal, replacing the pain with a tingling, or buzzing sensation. The electrical stimulation serves as a distraction and allows your brain to focus on the tingling, often soothing sensation it makes. Spinal cord stimulation is usually considered when the pain is chronic and severe - and surgery, injections, physical therapy, medications, and other treatments have failed to give enough relief of pain. The spinal cord stimulator will not cure your pain. But you should expect a 50 percent or greater decrease in your pain following successful spinal cord stimulation. This should allow you to be more active, have less pain and need less pain medications. Spinal cord stimulation has been approved by the Food and Drug Administration (the FDA) for the treatment of chronic intractable pain in the trunk and limbs. It seems to work best for neuropathic pain, the type of pain caused by injury or disease to nerves. It has also been used when there is continued pain into the legs following back surgery. This condition is sometimes called Failed Back Surgery Syndrome. 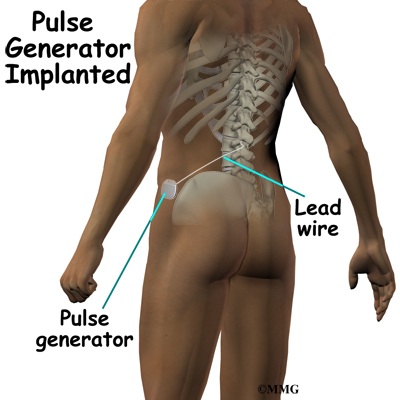 Spinal cord stimulation seems to be less helpful for back pain without pain into the legs. Spinal cord stimulation has also been used successfully for reducing pain from chronic regional pain syndrome (sometimes called CRPS), diabetic neuropathy, and vascular insufficiency. Before having the device implanted, you will be need to undergo both a physical examination and a psychological evaluation. There are several conditions that would prevent you from being considered a candidate for a spinal cord stimulation. If you have any type if active infection, this will increase the risk of infection around the spinal stimulator. If the infection is cured, this contraindication may be removed. You may be instructed to discontinue certain medications that affect the clotting of your blood several days before the injection. This reduces the risk of excessive bleeding during and after the injection. These medications may include the common Non-Steroidal Anti-Inflammatory Drugs (NSAIDs) such as aspirin, ibuprofen, naproxen and many other medications that are commonly used to treat arthritis. If you are taking any type of blood thinning medication you should let your doctor know. Medications used to prevent strokes, such as Plavix, can also affect blood clotting. These medications usually need to be stopped seven days prior to the procedure. Wear loose fitting clothing that is easy to take off and put on. You may wish to take a shower the morning of the procedure, using a bactericidal soap to reduce chances of infection. Do not wear jewelry or any type of scented oils or lotions. The complete spinal cord stimulation procedure is actually done in two stages. In the first stage, called the trial, the electrodes and wires are placed into position in the spinal canal and left protruding through the skin. Think of this as similar to having an IV in your arm. The stimulator device can be connected to these wires and used to control the amount of spinal stimulation. The trial can last up to seven days while you test the amount of pain relief you get from using the device. If you and your doctor are pleased with the result and both of you consider the trial a success, you will be scheduled to have a second procedure where the device is implanted permanently under the skin. If you and your doctor are not pleased with the result and consider the trail a failure, the wires are removed and nothing remains inside your body. Being able to undergo a trial is one of the great benefits of spinal cord stimulation - you get to give the procedure a test drive before you commit to having the device permanently implanted. Both the trial implantation and the permanent implantation procedures usually take place in an operating room, either in a hospital or in a same day surgery facility. An operating room is a sterile environment that decreases the risk of infection. Each procedure may last up to three hours. You should be able to go home the same day. To perform the procedure, you will be given an intravenous sedative to help you relax and a local anesthetic will be used to deaden the area where the wires are inserted. A general anesthetic is not normally used, especially during the procedure for the trial implantation. You will need to be awake so that you can help guide your doctor when adjusting the device in order to provide the best pain relief. Placement of temporary wires for the trial is a minimally invasive procedure. 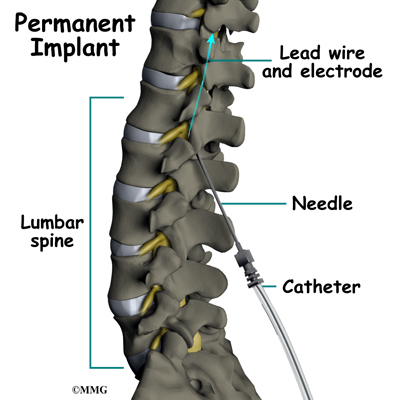 An epidural needle is placed through the skin and into the spinal canal near the spinal cord. This is done with the help of a special X-ray called fluoroscopy. The electrode wires are then inserted through the needle and pushed through the spinal canal until they are in the right position. The wires are then attached to the external stimulator device. Your surgeon will adjust the wires and tune the stimulator. When satisfied with the placement of the wires, a stitch to your skin is used to keep the electrode wires in place for the trial period. You are able to adjust the strength of the electrical stimulation and turn it off and on using the external device. When the stimulator is on, you should feel a tingling sensation that covers the area of your pain. 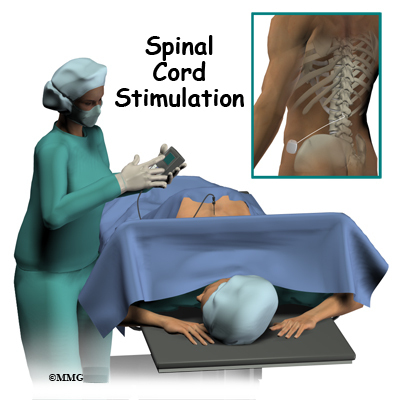 The procedure for permanent placement of the spinal stimulator is very similar to the trial. 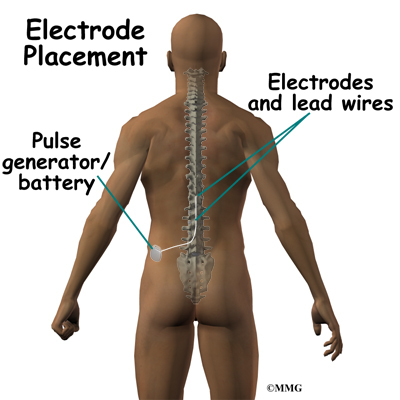 The new electrodes can be placed in the same way using the needle technique, or if more precise placement is needed a small incision may be necessary over the spine. The wires are then tunneled under the skin to the area where a small incision is made to place the stimulator device under the skin. If your pain is in your legs, an incision is made on your lower abdomen or upper buttock. For pain involving the arms, an incision is made on the side of the chest. The stimulator device is controlled by a wireless controller that you should keep with you at all times. The controller allows the stimulator to be programmed to adjust the type and strength of the electric stimulation. 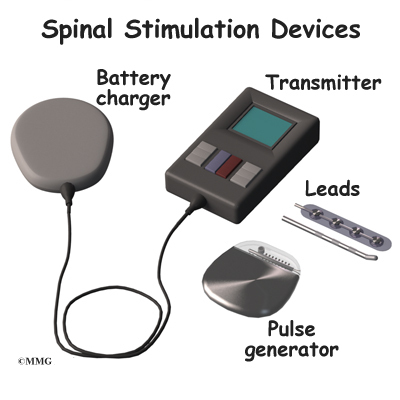 The spinal cord stimulator is not necessarily permanent. It may be removed if necessary. The battery may last two to five years. The device must be removed surgically and the battery or the device replaced. Spinal cord stimulation is considered minimally invasive and safe. However there are several complications that may occur during or after this procedure. No invasive procedure is 100 percent foolproof. Complications are uncommon, but you should know what to watch for it they occur. An epidural hematoma occurs due to excessive bleeding into the spinal canal. The bleeding can cause pressure on the spinal cord. This, in turn, can cause paralysis or loss of movement of the limbs. Loss of bowel and bladder function can also occur. This complication requires emergency surgery to drain the hematoma and relieve the pressure. The spinal cord damage can be permanent. A pneumothorax is the collapse of a lung. A lung can be punctured when needles are inserted in the area of the chest or upper back. If the pneumothorax is small, then it may only require watching for several days until it resolves. If it is severe and interferes with your breathing, a chest tube may need to be inserted to re-inflate the lung. Damage to the spinal sac during the insertion of the electrodes may cause a persistent spinal fluid leak. The symptom that you will experience if this occurs is a very bad headache. The headache is worse when you are sitting or standing upright. It may cause nausea and vomiting. It will go away if you lie flat or with your head a bit lower that your feet. The headache occurs because the spinal fluid pressure in the skull decreases. That is why the headache goes away when you lie down - the spinal fluid pressure goes back to normal in your skull. Most spinal headaches go away in a few days when the hole in the spinal sac heals and closes. You may be instructed to stay flat for a couple of days until this occurs. If your headache lasts longer than 48 hours, call your surgeon. A spinal fluid leak may require surgery to correct. 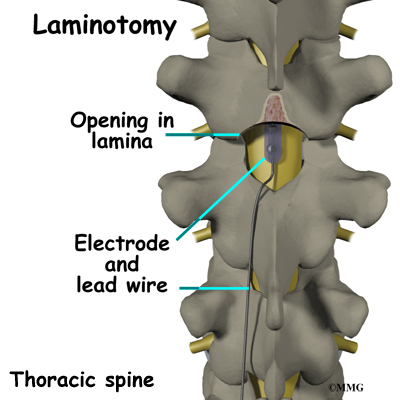 Nerve damage caused by needles and electrodes placed in the area of the spinal cord may occur. Even paralysis that could be permanent could occur. A seroma is the collection of fluid that develops in the pocket around the implanted device. It can last several weeks or months. It can be drained by your surgeon. If the fluid in the seroma becomes infected, the device must be removed and the infected fluid drained. You will need to lie down as much as possible for 12 hours following your surgery. Your surgeon will allow pain medication for the first few days following surgery. Narcotic pain medications can cause constipation and laxatives may be necessary to have regular bowel movements. You may be asked to avoid the use of an anti-inflammatory such as aspirin, ibuprofen, (Motrin), naproxen (Aleve) as they can cause bleeding. You should expect some mild swelling and bruising at the incision site. Ice packs may help with pain and swelling. There will be sutures or staples and a dressing covering the incision. Call your doctor immediately if you run a temperature, or notice redness, swelling, separation, or drainage from the incision. You will be given instructions on how to operate your spinal cord stimulator. Usually one or two hours of stimulation, three to four times a day is enough to relieve pain for the rest of the day. You should expect 50 to 70 percent improvement in your pain. The device should be turned off when driving and operating machinery or power tools. After six to eight weeks, you should be able to resume and eventually increase your activity level. As you learn to live with your new device there are a few things you should know. Electronic systems that contain magnets will need to be avoided. They can interfere with the electrical current from your device. These include security systems found in libraries and airports. Strong X-rays, ultrasound, and magnetic resonance imaging (MRI) should also be avoided. Microwaves, cell phones, pagers, and anti-theft sensors will not affect your stimulator. You will be given an identification card that can be shown to airport and other security officials when necessary. The ID card can also be used in the event of a medical emergency. 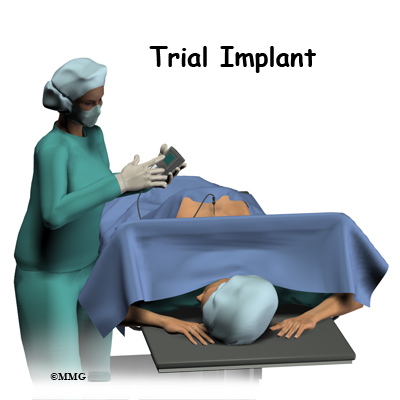 It is important for medical providers to know about the implanted device. And remember, the spinal cord stimulator is not a cure for your pain; it is only a part of your overall pain management plan. You will still need to continue working with the other recommendations from your pain management team.